Saturday, February 9, 2019, 6 PM to 10 PM. St. Mary's Church, Howley Hall, 219 Bean Ave., Los Gatos, CA 95030. 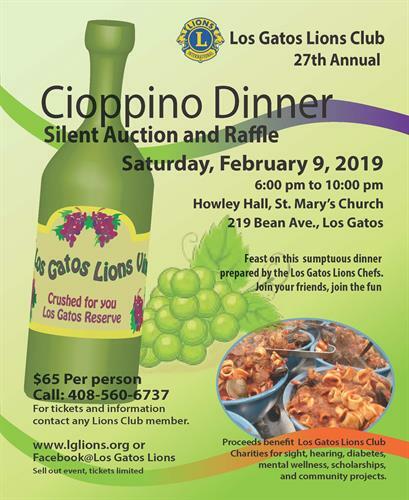 The Los Gatos Lions Club 27th Annual Club Cioppino Dinner, featuring a live and silent auction and raffle, on February 9, 2019, 6:00 to 10:00PM. Feast on a sumptuous 4 course dinner with wine on the table and no host bar available. Held at St. Mary's Church, Howley Hall, 219 Bean St., Los Gatos. You will not want to miss this outstanding dinner and fun filled event. Proceeds benefit Los Gatos Lions Club Charities for sight, scholarships and community programs for all ages. Tickets $65 each. Purchase tickets from any Los Gatos Lions Member or Call 408-560-6737.